This post is a detailed example of computing individual elements of SCDF(S, 2, 2, L, 3) at each of the three scales on S = [1, 2, 3, 4, 5, 6, 7, 8]. SCDF(S, 2, 2, L, J) notation is defined here. This notation is based on the notation introduced in Chapters 3 and 4 in "Ripples in Mathematics" by A. Jensen & A. la Cour-Harbo. Figures 1 and 2 show the formulas for the elements of S and D at scale L = 1. Figure 3 shows an example of computing the first scale of the signal S = [1, 2, 3, 4, 5, 6, 7, 8]. 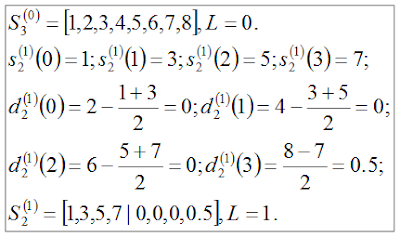 Figure 4 shows the individual formulas for S and D at scale L = 2. Figure 5 shows the computation of individual elements of S and D of the sample [1, 2, 3, 4, 5, 6, 7, 8] at scale L = 2. 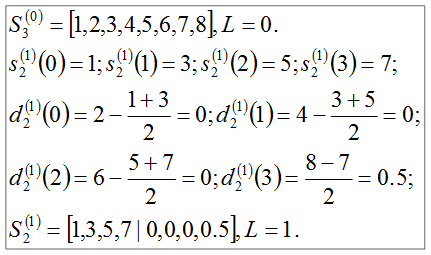 Figure 6 shows the individual formulas for S and D at scale L = 3. Figure 8 shows the computation of individual elements of S and D of the sample [1, 2, 3, 4, 5, 6, 7, 8] at scale L = 3. Figure 8 summarizes the three scales of SCDF(S, 2, 2, 3, 3), where S = [1, 2, 3, 4, 5, 6, 7, 8].